Fluent language skills in 3 months with an easy exercise routine! Many students who have just started their language studies wonder how long it takes to learn a new language. WordDive promises fast results, but what does that actually mean? How many new items can you learn in one day? When can you say you speak a language? As the subject interests so many, we decided to find out what is the median learning speed of the WordDive users. The results were amazing: you can become fluent in a language in only three months! In the following, we will take a closer look at the results – this makes truly motivating reading, so be sure to check it out! How do the studied language and the age affect the learning speed? Learning speed is naturally an individual matter, and it is determined not only by your personal competences, motivation and use of time, but also by your native language and just how complex the language you study is. However, we can obtain some indicative information on how fast you can learn a language by examining WordDive users’ median learning speed. Our review is based on the permanently learned study items, which best represent your actual language skills. The first figure below shows the median of permanently learned study items a WordDive user learns in one academic hour (45 minutes) in different languages. As you can see, there are some important language specific differences. 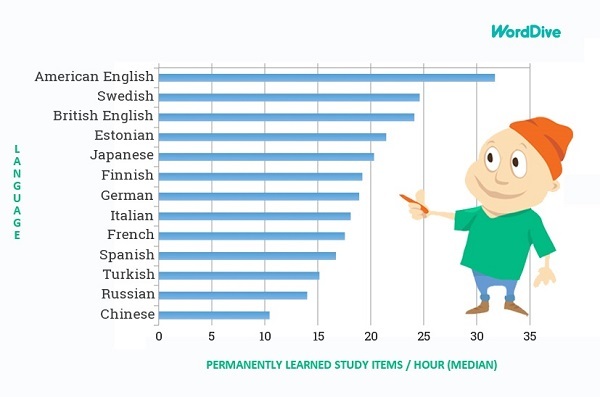 While a user who studies American English absorbs a median of 32 new items per hour, a student who is learning Chinese – often defined as one of world’s most difficult languages – stays clearly behind with about ten permanently learned items. What does the median speed of the language you are studying look like? The second figure points out how age affects the learning speed. It is hardly surprising that young adults are the fastest learners. 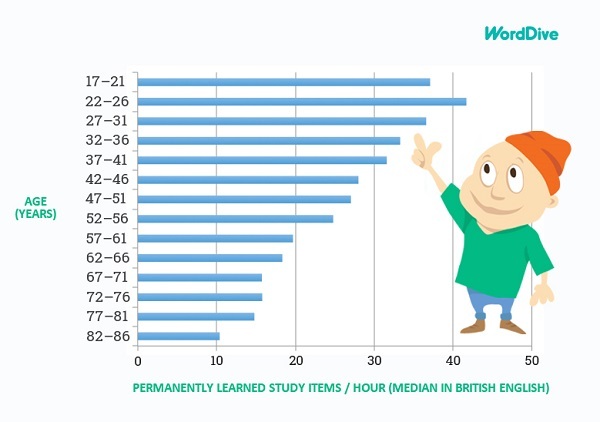 WordDive students in their twenties learn a median of 35–45 items per hour but what is also remarkable are the wonderful results among older age groups! From zero to fluent in only three months! It is interesting to view the figures in relations to personal study goals. If you are studying British English in order to find your way on a tourist trip to London, 200 permanently learned study items are enough. For a 40-year-old, this takes about six hours of exercising with WordDive. The milestone of 2000 permanently learned items can be reached in about 13 weeks by a 40-year-old learner, if he or she exercises five times a week, 45 minutes at a time. This means that you can become fluent in a language in only three months! Wow – with WordDive you can definitely forget about lengthy language studies with hours and hours of exercise sessions! Thus, the answer to the question how fast you can learn a new language depends also on what level of language skills you are aiming at, and how much time you are willing to dedicate to your language studies weekly. Don’t forget to make use of WordDive’s Plan your week tool to see how close you are to your next goal considering your personal studying pace. Individual differences in learning speed are significant, but the great news is that with WordDive everybody learns fast! The service individually adjusts your learning so that both the speed of progress and the content of the exercises are optimal for you. You can learn a language in record time if you have time and a strong motivation for exercising. But you can also advance calmly, without a rush and at you own pace. Fast or a little slower – with WordDive, you will succeed! PS. As your learning speed will accelerate after you complete at least one entire course, we recommend that you wait until then to compare your results to the figures presented above.